During the past few years the PIC microcontrollers appeared as a new challenge and opportunity in my hobby projects, that are mostly related to DIY high-end audio. I will happily share my results with the rest of the PIC community. This page provides a short overview to my activities in this area. A fan speed controller for PC fans, supporting multiple fans and temperature sensors. A high-end audio DAC with a PIC to control the other chips through SPI, and to implement a software PLL. For all my PIC projects I program in 'C' only. For this I use the free version of of the CC5x compiler, which by default directly creates a .hex file from a .c source file. For programs that grow larger than allowed by the free version of CC5x, I split the source in different C-files, use CC5x to compile them one-by-one to .asm, and then use the free (open source) GNUPIC tools for assembling and linking. This setup works fine to me. 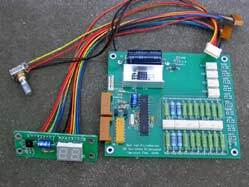 As programmer device I used until recently the extremely simple and compact topic2, attached to the parallel port of my PC. This circuit and the associated download program on the PC is from David Tait. (See also the pictures and description in German here.) Unfortunately, I later got into problems with this device, as far as I analysed a result of parasitic crosstalk between the output wires.